The UV1A3/6, UV2/UV2A6, 45UV3, UV90-3/6/9 Scanners are used with the M-Series, M-Series II, MicroM, FlameWorx, MB-2 and D-Series controls as well as the Fireye FLAME-MONITORTM, BurnerLogix and Nexus System. The UV1A3/6 scanners come with 3 ft. and 6 ft. cables rated for Tray Cable - Exposed Run (TC-ER) and complies with the crush and impact requirements of the standard for metal clad cable, UL 1569. The UV2 (36 inch) and UV2A6 (72 inch) are fitted with a 3/8” NPT female to 1/2” NPT male adapter fitted into the 1/2” threaded cou- pling of the UV1A3/6 respectively. The UV90-3/6/9 is available with 3 ft., 6 ft. and 9 ft. shielded flexible cables. The UV8A Scanner is a 90? right angle ultraviolet flame scanner used in conjunction with the M-Series, M-Series II, MicroM, FlameWorx, MB-2 and D series controls as well as the Fireye® FLAME-MONITORTM, BurnerLogix and the Nexus System. It is available only with 72 inch (1830mm) unshielded lead wires. The 45UV3 Scanner has a rugged cast housing that mounts on a 3/4 inch pipe with sleeve and set- screw. The replaceable UV tube is mounted in a vertical position for greater sensitivity. Non self- checking. The UV90 Series Scanners are designed for front and lateral (90°) mounting which, in some applica- tions allow the scanners to obtain a clearer view of the flame. The UV90, with its exclusive snug-fit mounting block, eliminates the need for a threaded sight pipe. The UV tube is made of quartz and is filled with a gas that ionizes when struck by UV radiation from the flame. In the absence of UV radiation, the gas acts as an insulator between two electrodes which are mounted inside the tube. These electrodes are energized continuously by a high voltage. During combustion, UV radiation ionizes the gas, causing current pulses to flow between the electrodes. 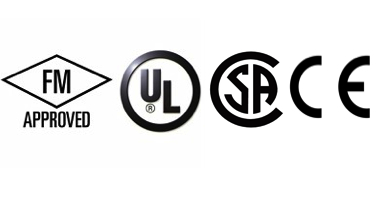 These current pulses result in a flame signal which is transmitted to the amplifier in the control, where it is processed to energize or hold in the flame relay. UV scanner, 1/2" NPT connector, 3 ft. cable rated for Tray Cable - Exposed Run (TC-ER). UV scanner, 1/2" NPT connector, 6 ft. cable rated for Tray Cable - Exposed Run (TC-ER). UV scanner, 1/2" NPT connector, 12 ft. cable rated for Tray Cable - Exposed Run (TC-ER). UV scanner, 1/2" NPT connector, 50 ft. cable rated for Tray Cable - Exposed Run (TC-ER). 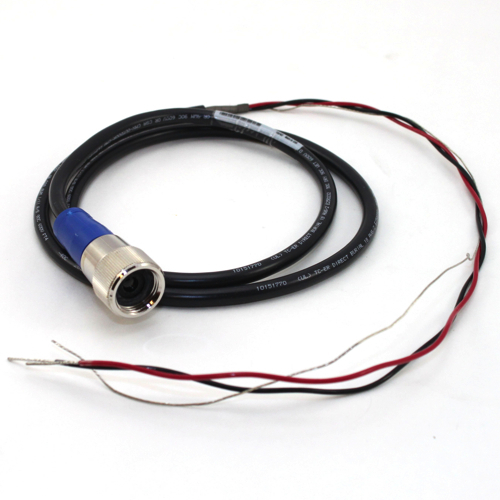 UV scanner, 3/8" NPT connector, 3 ft. cable rated for Tray Cable - Exposed Run (TC-ER). UV scanner, 3/8" NPT connector, 6 ft. cable rated for Tray Cable - Exposed Run (TC-ER). UV scanner, 1/2" NPT connector, 90 degree angle head, 6 ft. cable, no armor flex. UV scanner, 1/2" NPT connector, 90 degree angle head, 20 ft. cable, no armor flex. UV non-self check scanner for frontal or side (90 degree) viewing. Complete with mounting fixture and 3 foot flex conduit (900 mm). UV non-self check scanner for frontal or side (90 degree) viewing. Complete with mounting fixture and 6 foot flex conduit (1800 mm). UV non-self check scanner for frontal or side (90 degree) viewing. Complete with mounting fixture and 9 foot flex conduit (2700 mm). UV scanner, 3/4" mount, 4-314-1 UV tube. Cenelec EExd IIC explosion proof housing with UV1A scanner. NEMA 7, Class 1, Div 1 and 2, Groups C and D; Class 2, Div 1 and 2, Groups E, F, and G housing with UV1A6 scanner. NEMA 7, Class 1, Div 1 and 2, Groups C and D; Class 2, Div 1 and 2, Groups E, F, and G housing with UV1A50 scanner.